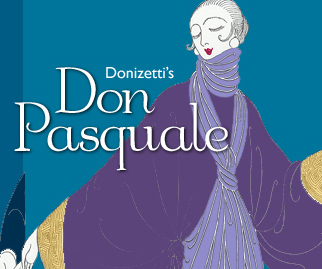 Boston Midsummer Opera Presents "Don Pasquale"
For its seventh season, Boston Midsummer Opera will present the sparkling comic masterpiece, Donizetti’s "Don Pasquale," playing Tsai Performance Center at Boston University (685 Commonwealth Avenue) for three performances only, July 25, 27 and 29. Obie Award winner and Tony Award nominee Austin Pendleton will direct the fully staged and costumed production. Music director and nationally acclaimed conductor Susan Davenny Wyner will lead the performances, which will be performed with orchestra and sung in English. Metropolitan Opera bass Ricardo Lugo will sing the role of Don Pasquale. "Don Pasquale" is an opera bursting with life and lyricism. Its drama promises a few surprises along the way, especially at Don Pasquale’s expense. The old bachelor Don Pasquale plans to marry in order to punish his rebellious nephew, Ernesto, who's in love with the young widow Norina. Pasquale wants an heir so he can cut the young man off without a penny. He consults Dr. Malatesta, who suggests as a bride his own beautiful, younger sister. Feeling his youth returning, the delighted Pasquale tells Malatesta to arrange a meeting at once. Ernesto learns that his friend Malatesta has arranged Pasquale’s marriage and feels betrayed, but little does he know that Malatesta is in fact plotting on Norina and Ernesto’s behalf. Puerto Rican bass Ricardo Lugo (playing Don Pasquale) is a versatile, much in demand international performer, making his BMO debut. This season he returns to the Metropolitan Opera for productions of "Ariadne auf Naxos" and "La fanciulla del west." His work at the Metropolitan Opera during the 2009--2010 season included productions of "Ariadne auf Naxos" and "The Nose," and he has also participated in the Met’s productions of "Macbeth," "Adriana Lecouvreur," "The Gambler" and "Salome." Lugo has also appeared as Timur in Puccini’s "Turandot" with DiCapo Opera Theater while his concert engagements have included Verdi’s "Requiem" with the Mexico State Symphony, the Music in the Mountains Festival in Colorado, and Beethoven’s "Missa Solemnis" with New Mexico Symphony Orchestra. Soprano Leslie Ann Bradley (playing Norina) attended Tanglewood and the Académie International de musique Maurice Ravel in France, studying with the renowned Françoise Pollet. Her success there was marked by receiving the Prix du chant Pierre Bernac as winner of the Academy’s voice competition. She was featured in Rossini’s "Petite Messe Solennelle" with both the Grand Philharmonic Choir and Hamilton’s Bach-Elgar Choir, sang Micaëla in Peter Brook’s "Tragedy of Carmen" with the Boston Midsummer Opera, and was heard in Orff’s "Carmina Burana" with the Victoria Symphony. Baritone David Kravitz (playing Dr. Malatesta) was last seen with BMO in its 2011 production of "The Italian Girl in Algiers" and with the BMO in its 2006 production, "The Marriages of Mozart." He made his New York City Opera debut in Strauss's "Intermezzo," and his European debut at Monte Carlo's Salle Garnier in the world premiere of Tod Machover's "Death and the Powers" which subsequently traveled to Chicago Opera Theater and the American Repertory Theater. He also returned to Opera Boston for Hindemith's rarely-heard opera "Cardillac," and sang Nick Shadow in Emmanuel Music's production of "The Rake's Progress." Tenor Alex Richardson (playing Ernesto) makes his BMO debut in "Don Pasquale. " He has performed with Santa Fe Opera and the Atlanta and Chicago Symphonies. As a Tanglewood Institute Fellow, Mr. Richardson sang the role of Vogelgesang in Act III of Wagner's "Die Meistersinger von Nürnberg" under the baton of Maestro James Levine and also performed solos in Stravinsky's "Pulcinella" with Maestro Rafael Frühbeck de Burgos. Included among his roles are Fenton in "Falstaff," Camille in "The Merry Widow," Rodolfo in "La Bohème," Cavaradossi in "Tosca," Alfred in "Die Fledermaus," and the title role in "Albert Herring." Austin Pendleton is an award winning actor, director and playwright. In 2007 he was the recipient of a Drama Desk Special Award as Renaissance Man of the American Theatre. He has been aptly described as the soul of American theater. He has been seen on Broadway in "The Diary of Anne Frank" and "Grand Hotel." He has appeared in the first New York productions of "Oh Dad, Poor Dad," "Fiddler on the Roof," "Hail Scrawdyke" (Derwent Award), "The Last Sweet Days of Isaac" (Obie Award), "The Sorrows of Frederick", "Doubles," "The Imposter," "The Loop and Sophistry," and in the title roles of Off-Broadway productions of "Hamlet," "Richard III," "Uncle Vanya," "Keats" and "Jeremy Rudge." He is a playwright ("Orson's Shadow," "Booth and Uncle Bob"), director ("Spoils of War," "The Runner Stumbles" and Elizabeth Taylor in "The Little Foxes"), teacher (HB Studio), and member of Chicago's Steppenwolf Ensemble. He began his career, and has acted and directed many times, at the Williamstown Theatre Festival. Conductor Susan Davenny Wyner has received national acclaim for her conducting. The Library of Congress featured her in its 2003 "Women Who Dare" Engagement Calendar, and the "MacNeil-Lehrer Newshour" and WGBH have presented special documentary features on her life and work. Her conducting credits include the Los Angeles Philharmonic, The Czech Philharmonic Chamber Orchestra, Boston Lyric Opera, the Danish Odense Symphony, and Cleveland Orchestra in special benefit concerts. Prior to her conducting, she had an international career as a lyric soprano, singing with the Metropolitan Opera and major conductors and orchestras. For tickets, call 617-227-0442 or visit www.bostonmidsummeropera.org.